College application essays have long been regarded as the most daunting and unpleasant task facing high school seniors as they start their college applications. Depending on the number and type of schools to which a senior is applying, she could easily need to write ten or more essays, counting all the supplemental essays asked for by the colleges on her list. Because of the magnitude of college application essays, it is important for rising seniors to start writing their essays the summer before their senior year. While I know that the last thing rising seniors want to do during their precious summer months is write college application essays, once October and November roll around they will be very grateful to their past selves who buckled down and did it! Here are some tips for all those rising seniors out there tackling this task. 1. Start with a Moment. For most prompts, if you can isolate a single moment in time and have the rest of your essay stem from that moment, you can write something that will be both compelling and insightful. For example, if you are answering the fourth Common Application prompt (Describe a place or environment where you are perfectly content. What do you do or experience there, and why is it meaningful to you?). For your college application essays, pick an actual moment when you felt that way and start from there. By starting small, you keep the essay specific and personal, two very important characteristics of a good essay. 2. Show, Don’t Tell. This goes along with starting with a moment. When talking about your life in your college application essays, use words that put the reader in the moment, instead of simply telling what happened. The more descriptive and evocative your language, the better chance you have of bringing the reader out of her surroundings and into your life. You want the admissions officer to be able to tell a story about you, one that makes sense and gives the others on the committee a reason to admit you to the school. 3. Keep in Mind What You Are Trying to Tell the Reader. College application essays are the best way to communicate who you are to the admissions office of a college. As the writer, you need to have a clear idea of what you want to tell the reader about yourself. What piece of your life do you want to share, and why? Once you have a first draft, go back and read it to see if your message comes through clearly. If not, you need to revise it so that the reader will know exactly what you are trying to tell her. Don’t waste this opportunity and come up with something generic – be specific and clear. 4. Be Positive. The message that you send should be positive. I know that self-deprecating humor is a foundation of teenage life, but this is not the time for it. If you find yourself playing down your accomplishments or using negative language, go back and revise your college application essays. You don’t need to brag, but you do need to put yourself in a positive light. This is one of the reasons I’m not a fan of the second Common Application prompt (Recount an incident or time when you experienced failure. How did it affect you, and what lessons did you learn?). Unless you have an incident on your record that you feel you must explain, this prompt can be very difficult to answer in a way that leaves the reader with a positive impression of you. 5. Answer the Prompt. It sounds simple, but it can be very hard to do. Admissions officers want to see the entire prompt answered, and many students fail to do so in their college application essays. For example, the first prompt for the UC’s asks you to “describe the world you come from — for example, your family, community or school — and tell us how your world has shaped your dreams and aspirations.” Most students have no difficulty describing their world, but falter when it comes to showing how it has shaped their dreams and aspirations. My advice – figure out what your dreams and aspirations are before starting to write the answer to this prompt. Once you do, the description will flow naturally. 6. Supplemental Essays are Important. Put just as much energy into your supplemental essays as you do into the longer ones. For many schools, these essays are the ones that tell them how badly you want to be at their school and whether you would fit with their student body. The “Why Us?” college application essays are particularly important. The school wants to know that you actually have a reason for applying other than your mother made you do it or everyone applies there. This is where you show that you have done your research. Use this essay to show not only what makes the school special, but also how those special qualities are just what you are looking for. Relate the school and its features to you and what you want. If you are having a hard time with this essay, ask yourself if you really do want to go to that college. If the answer is no, then don’t apply! 7. Revise – Many Times. Finally, this is not a simple process. Your first draft will be far from perfect. In fact, your first draft may not even be on the same prompt that you end up using! The important thing is to write a first draft knowing that it is a first draft of you college application essay. Don’t be worried about word count, grammar, or spelling – just write something. Once you have some words on the page, you can read back over it – aloud to yourself is best – and revise it, keeping these tips in mind. While you should have one or two people help you by reading your essay and commenting on it, don’t ask more than that to look it over. The more people who provide input, the easier it is to lose your voice in the essay. At the end of the day, the admissions officers want to hear what you, not your mom or admissions counselor, have to say. Hopefully these tips will help as you start writing your college application essays, but the most important tip of all is to start! The more you can get done now, the happier you will be in the fall. Good luck! 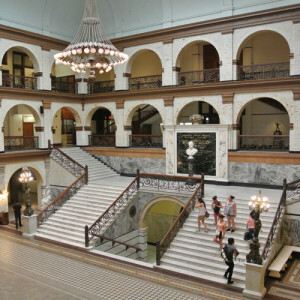 PHOTO CREDIT: Special thank you to EKD for the use of their photo taken at Drexel University.